Have you decorated your home for Christmas yet? Usually I wait until Thanksgiving but this past weekend was the first weekend since July that we had nothing on the calendar and I was itching to bring the decorations out. One of my fave purchases from last year are my Christmas pillow covers. I absolutely adore them. Pillows are such an easy way to change up the decor in your home without spending a ton of money. 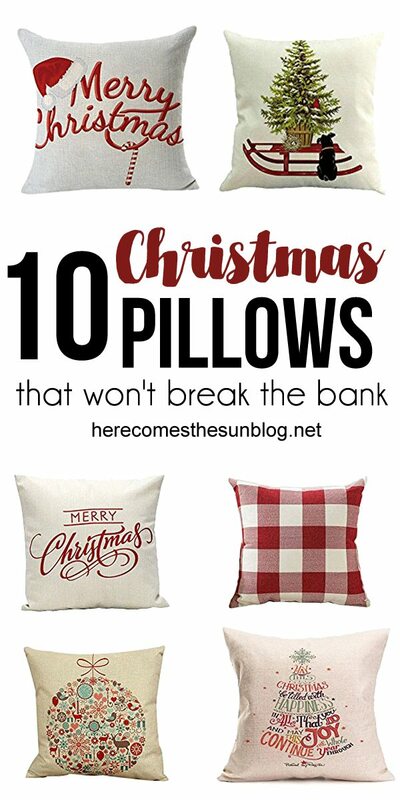 I’ve put together a list of affordable Christmas pillows so you can decorate for cheap too! Click on the image(s) to purchase. These are the pillows that I currently have on my sofa. They are super high quality and I just love them! I love pillows that come in a set. Perfectly coordinated means easy decorating for me! Candy canes and Santa? Sign me up! This plaid pillow would look great paired with any red/white pillow. I just love Christmas decor that includes sleds. How adorable is this pillow? This pillow has a hand lettered look. And you all know how I LOVE hand lettering. This Believe pillow would look great on a chair or loveseat. It would also look good on a bed if you decorate bedrooms for the holidays. I’m loving the modern twist on a classic ornament design of this pillow. National Lampoon’s Christmas Vacation, anyone? A classic pillow that will complement just about any type of Christmas decor. WANT MORE CHRISTMAS PREP IDEAS? CHECK OUT HOW I ORGANIZE MY ENTIRE CHRISTMAS AND ALSO 5 THINGS YOU CAN DO TODAY TO PREPARE FOR CHRISTMAS.